Every once in a while I like something sweet. Something that really gets my mouth watering with it’s sweetness. I have a definite sweet tooth! So it’s been fun for me to find ways to “trick” my sweet tooth in to thinking that I ate something nice and sweet, getting that deeply satisfied feeling of having sated the sweet tooth, while still keeping it nice and healthy. Well, Apple-Roasted Steak with Cinnamon, All-Spice, and Nutmeg has been a great way to convince my sweet tooth that I’m pampering it, while still eating a deliciously healthy meal, with no added sugar! Start the steak first, on high heat in a covered pan. While the pan is heating up, slice up half of the apple and layer the slices over the steak, adding the spices on top of the apple. As soon as the apple slices are on the steak, turn the heat down to medium-low (2-3 out of 10), and continue to cook with the cover on the pan. This is one of the most delicious, savory, sweet meals that I make, and I would have it daily if there weren’t other great meals I wanted to make too! As soon as the first half of the apple is on the steak, start to slice up the carrots. I like the carrot slices to be on the thick side for this meal. They will be slow-roasting in the pan with the apples, cinnamon and spices, and the steak, so a thicker cut can be a good thing. As the carrots are sliced up, add them to the pan around the outside. If there is more heat in the center, you want that on the meat, leaving the slightly less heated outside for the carrots. At medium-low heat, it shouldn’t make much of a difference, but the carrots are more likely to burn than the beef, so I like to keep the carrots on the outside. 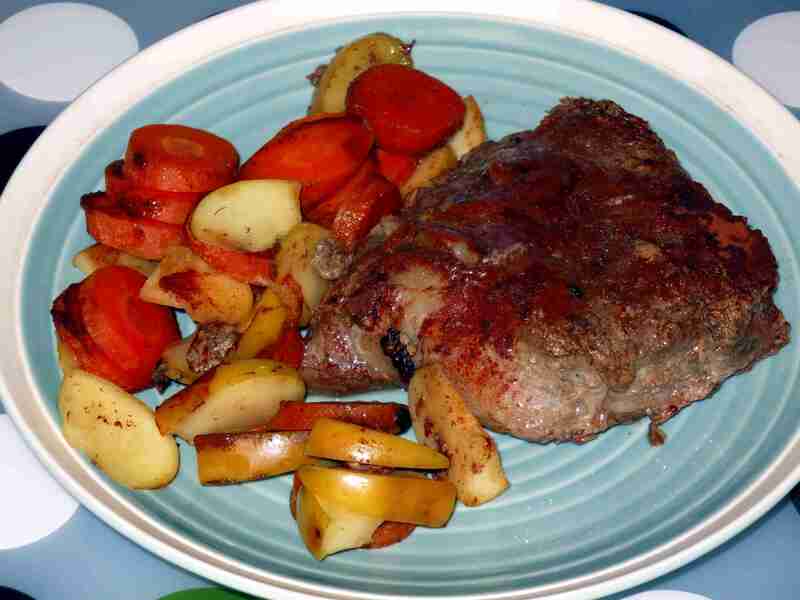 After about 15-20 minutes of cooking, scrape the apple slices off the beef and onto the carrots, and flip the beef. Make sure that nothing is underneath the beef after you flip it – it will change the heating profile for the meat and make it cook unevenly. More importantly, it will interfere with the delicious apple juices from permeating the beef! 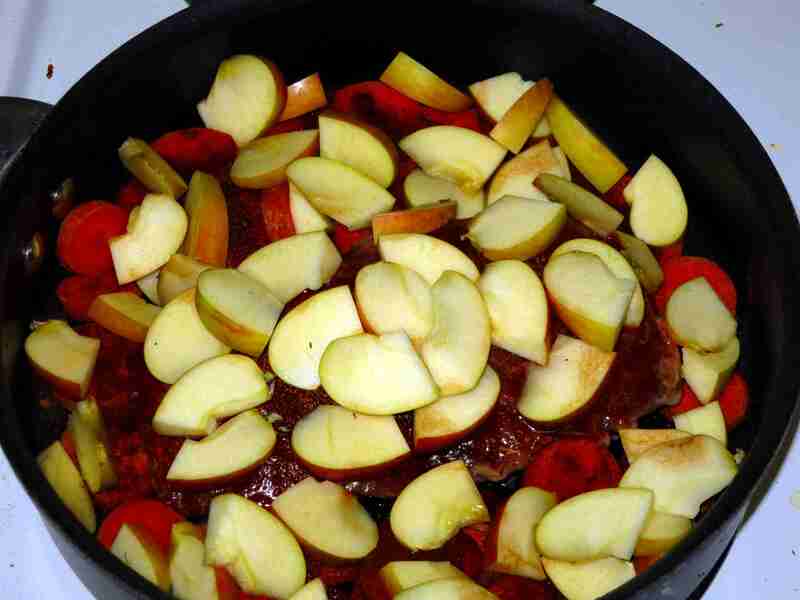 Slice the second half of the apple, cover the meat in apple slices, and lightly add more spices. This is the key – you want the steak to have even access to the apple slices. There were fresh apple slices for one side – you need fresh apple slices for the other side! Trust me, the flavor is so worth the extra work! After another 20 minutes of cooking, turn the heat up to high and remove the steak from the pan. The order is not terribly important, but since the steak will be cooling on the plate, I usually turn the heat up first. For the next several minutes, cook off the last bit of liquid in the pan, stirring the carrots and apples thoroughly. This should take no more than 5 minutes, and hopefully less. Since you want the liquid to cook off, there’s no need to cover the pan. As the steak is done, plate that immediately. You need to put the steak somewhere when you take it out of the pan – it may as well go on the plate! And, as the stir-fry is done, plate that as well. Serve hot, and eat immediately! I recommend starting your meal with the steak, since it’s have a few moments to cool off… And enjoy! Out of my approximately 110 visitors per day, how many of you actually reads the entire post? If you’re reading the entire post, what kinds of feedback questions would you like to see at the end? And are there any other ways to make this slightly more interactive than just asking you all some questions? YUMM!!!! I am MAKING this! Awesome Meg! I’m so glad you like it! Thanks! I definitely try to get in a couple meals per week like this – it’s just too good!! Thanks Deb – I’ve been loving apples with my meat! I’ve done it with chicken, pork, and beef, and I just can’t get enough!! Thanks Paulin! I’ve been going nuts for this – I really can’t get enough of it! Something about how the apple-flavors seep in to the meat is just phenomenal! I’ve done it with chicken, pork, and beef – and couldn’t be happier with the results! I did read this whole post as it did catch my attention. I admit, I do skim the reader as I cannot read everyone all the time! What caught my attention was ‘tricking the sweet tooth’. Please see my post “the Great American Breakfast” as I would love to hear your comments! Why do you eat Paleo? The food scene is changing rapidly I wonder are their really good foods and bad foods? I took a look – it’s clear that you’re definitely starting to head down the rabbit hole with regards to what real food is. Congratulations! You have a long and arduous road ahead of you, with many nay-sayers and “concerned friends” who will stop at nothing to get you to go back to your bowl of cereal… Here’s the thing: there’s no health to be found in processed foods (an undeniable truth). And grains/beans are inedible otherwise. I am more than happy to help you along your way – just keep your eyes peeled, eat real food: grass-fed beef, lots of veggies, and eschew all processed stuff. And ask for help any time you need it!!! I read all of your posts, Lucas! 🙂 Because I don’t eat meat, I don’t typically reply to questions about meat or ways to prepare it. (Maybe I could smoke some cheese or tempeh!) Could you make this with some kind of fish, like wild salmon? What do you think would work best? I LOVE smoked salmon! When I do smoked salmon, I buy a “Food Grade Cedar Plank” which you can easily find online. Some coconut oil, or hazlenut oil rubbed in to the cedar plank would make a GREAT replacement to follow these directions for salmon! This would work for vegetables too, though you’d have to experiment with the cook time – meat can handle the heat for a lot longer than vegetables can. In fact, you’ve inspired me to get some food-grade planks and do some crock-pot smoked meat using planks! Thanks Sherri! – Add some high-liquid vegetables/fruits like apples, tomatoes, or mangos on another plank stacked one level higher. This will drip the liquid down over the veggies, and keep the water vapor in the crock pot up. – Use high-starch veggies, but NOT roots/tubers. Good veggies would be: Zucchini (great with smoke flavor, trust me!! ), peppers, hot peppers, etc. This sounds really good. I might try it with chicken too. Hi Jenn – you are SO right! It’s great with chicken! That looks absolutely delicious. Iwill have to try it. Thanks Jay – I hope you like it! My pleasure Nellie – thank you for stopping in and checking out my post! Feel free to take a look at some of the other recipes and whole meals, as well as some of the interesting things I’m working on!